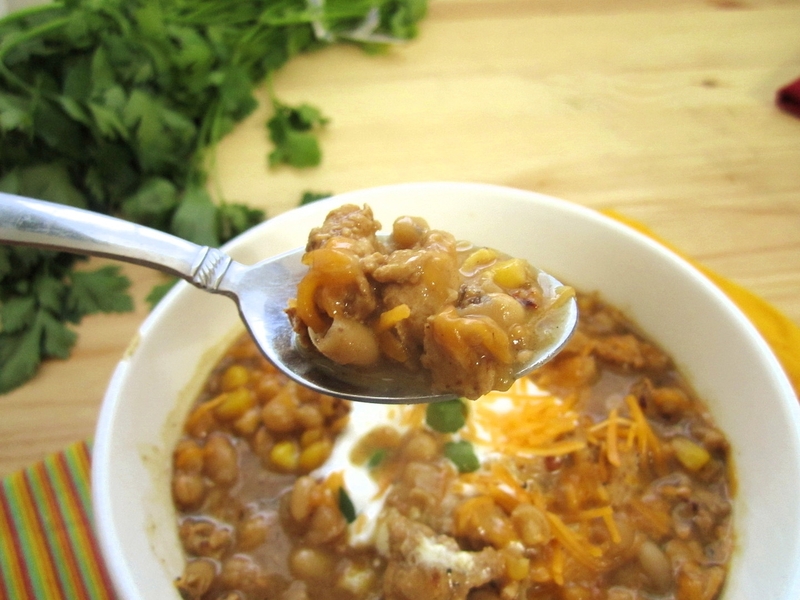 White Bean and Chicken Chili - Eat. Drink. Love. I have really been craving some chili lately. We’ve had some cold nights over the past week and I officially declared it a one-pot meal night! There was one problem with my chili plan. My husband informed that he does not like chili! What?! Who doesn’t like chili?! We needed a compromise. I thought that maybe making a white chili with different ingredients might be more appealing to him since it didn’t have the same ingredients as traditional chili recipes. So, did he like it? Yes, he did! I like it too. This chili has the perfect amount of spice and it was very flavorful! I think I actually liked it more than my traditional chili recipe. Definitely making this one again! oregano and cumin! Mmmmm.. the recipe sounds perfect. packed with flavors! Loving this chili. I bet it’s fab with chicken. I’ve not tried it that way but think I need to try. Looks really good, giving me a serious craving for chili. 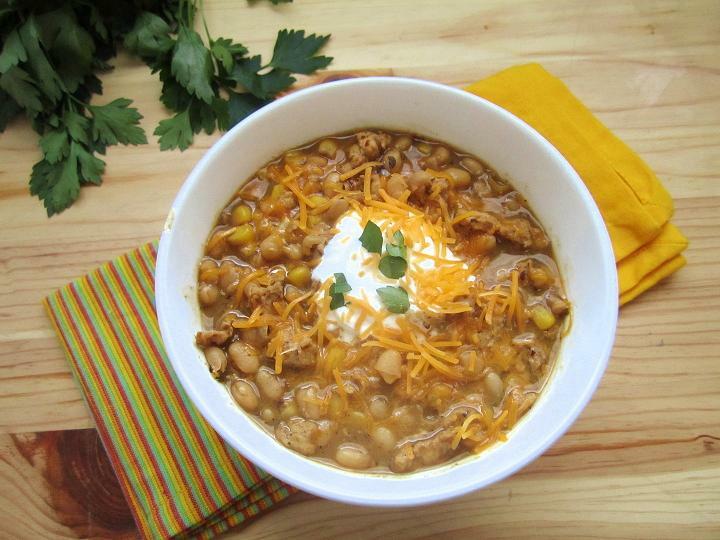 Love the flavors you used here in this chili…. God I am craving this now. I’m craving chili now too that I see your dish. Looks fabulous! Bet the herbs and spice really enhance the flavors. This sounds wonderful and I love that you used ground chicken versus big chunks. I grind partially frozen chicken thigh or breast meat in my food processor and it comes out great. Healthy dish, too! Ha-me and my hubby got into it the other day regarding “type of beans” he does not favor anything else besides pinto! I like this version of chili with the chicken broth instead of the thick tomatoes. It does look like a winner, healthy and tasty-Well done. This chili looks delicious! A nice healthier version to the traditional chili I’m sure! Thanks for sharing!! I LOVE white beans and canNOT wait to make this!! Yummy looking chili, Stephanie! I make white chili with chicken breast pieces but have never tried ground chicken so I’m looking forward to trying this one. Buzzed! I have a serious soft spot for this kind of chili. I’ve never thought of adding corn, though, and I think that’s a perfect addition! OMG! I just purchased everything to make white bean chicken chili for tomorrows dinner! Is this brilliant minds thinking a like or what?! Haha! Yes, great minds do think alike! I’m looking forward to seeing your recipe! This is one of our very favorites here! I havent made it yet this winter.. guess yours photo enticed me to make it as it look super fabulous! nice job! Chicken chili is my favorite! I make a super similar one with green chiles. This is perfect for the colder weather. I love this type of chili. As your temps go down, you can bet this will be at my dinner table in the coming days. I think this recipe makes a convert of non-chiii lovers! It’s been so cold that chilli sounds like a perfect dinner. My husband and kids are not into chillies because of beans… I am waiting for an occasion when I can make this for friends and I can enjoy. Your chillies look really delicious. I shouldn’t cheat and buy sour cream for this (I usually don’t know what else to use so I skip). Perfect presentation of chillies and I’m completely sold! That is such a lovely looking chili! I am planning to do a chili round up soon, any chance I could include it? That looks like pure comfort food. If only the weather in Florida would stay just a little bit cooler so I could indulge in my love of chili in the autumn!! Oh, I too have been REALLY craving chili lately… comfort food, yes please! Seriously, this particular chili appeals to me more than any others I’ve tried… maybe because I’ve never eaten chili without tomato sauce (not that I don’t love good tomato sauce, but this looks even better). Thanks for sharing. That’s sounds delicious and the pictures are are great too, thanks for the share. I much prefer chicken chili Stephanie. I wonder if it’s the chicken or that I just love white bean soups and stews so much! Glad your hubs liked it! How could he not? It looks just wonderful! A comfort food, perfect for cold and raining days. very nice!!! Absolutely Delicious!!! !i must try it. Pingback: Food Photography 101: Cameras - Eat. Drink. Love. 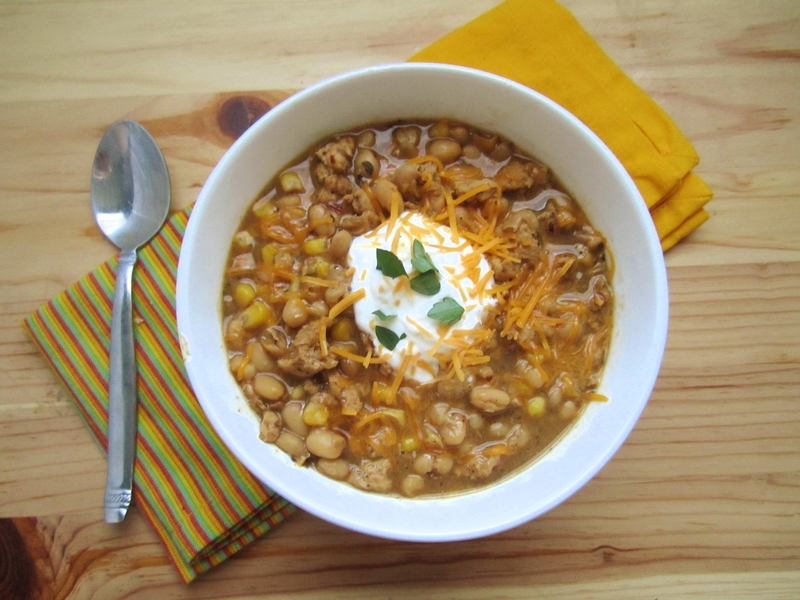 Pingback: Flashback Friday: White Bean and Chicken Chili - Eat. Drink. Love.